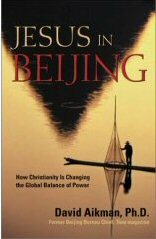 This book details the great unreported story of the Chinese giant and its enormously rapid conversion to Christianity and what this change means to the global balance of power. It begins with a detailed background of both Protestant and Catholic missionaries to China, back to the 600's A.D. when the first Christian Nestorians from what they called the "Eastern Church", visited and established themselves in China. Officially, there are now about 21 million Christians (Protestant and Catholic) in China. However, this figure widely loses confidence, as it doesn't take into account the vast network of "house churches" all across China, that haven't aligned themselves with the "state sanctioned and controlled" Christian Church. This means it is possible that there is now close to 80 million Christians in China, and this number may be growing rapidly. Chinese Christians believe that they will play a major role in the circumnavigation of the teachings of Jesus back to the Middle East. Along the way, an unbelievable (a few years ago) byproduct, just may be the world being witness to Chinese missionaries busting through the "Islamic Wall of Lies" surrounding Islamic countries. In 2002, the Communist Party Leader and President Jiang Zeming, was asked at a banquet; "Comrade Jeming. If before leaving office, you could make one decree that you knew would be obeyed in China, what would that be?" Jiang put on a broad smile, looked around the room, and said; "I would make Christianity the official religion of China." Targeted as an unruly Christian pastor who refused to join the state approved Chinese Church, Li was persecuted and then arrested by the police. He was then assigned by the Communists to a labor camp in Anhui Province, where he had to do extremely arduous labor, such as digging and moving iron ore. In the same cell where Li Tianen slept were two prisoners who were assigned to make sure that Li did not move his lips to pray. If he did, he was tortured. Once while working in the ore pit, Li tumbled 30 feet down an ore heap. He was believed to have been dead. Li says that while laying there his soul was flying around the prison camp "like an eagle" observing what was going on. Li says he was dead for more than 90 minutes, while the camp doctor worked to revive him. Li had stopped breathing, and he had no discernible pulse during this time. The doctor already had ordered other inmates to prepare a grave for Li Tianen. But suddenly Li opened his eyes. The doctor seeing that Li opened his eyes, first asked him who he was. "I am Li Tianen" the Chinese pastor replied. "Do you believe in God?" the doctor then asked Li. "Yes, I do." Li replied. Amazed at what he had just witnessed, the doctor said to Li; "I believe in God now". Miracles are commonplace in Chinese Christian circles. And it appears the Holy Spirit is working mightily there to bring up a new crop of fervent and true believers, who will play a main role in the Kingdom of God. Miraculous miracles are seen all the time by Christians in China. But there are also many out of the ordinary miraculous occurrences. Sister Chen Yurong tells the true story about her younger brother, a Communist party member who persecuted her fiercely for her Christian faith. Her brother had two sons, ages nine and five. One day as his sons were playing near the village water well she heard the older brother crying out in terror that his 5-year old brother had fallen into the well. The boy had not yet surfaced when Chen Yurong arrived at the well. Chen cried out to God, "Lord, save this boy! Let me die instead." Suddenly, as the villagers were gathering around the well, the young boy came to the surface of the water. The villagers lowered ropes, and the boy was pulled out of the well. "Did you swallow a lot of water?" one of the villagers asked the boy. "No," said the 5-year old boy. "There was a man in white holding me up." After this Chen's brother stopped persecuting his sister for her belief in Jesus. BibleProbe.com makes no money and is not compensated in any way for recommending a book. The above link is here for your convenience. You may find this book cheaper elsewhere.